These little loves are two of the nicest calves we’ve ever had at Russet Valley Farm. Both feature those brown beauty spots, so desirable in polled Herefords. As did their grandfather, Boyd Masterpiece 2020. Of course, Herefords have several other desirable traits, too. The girl calf has one sweet spot above her right eye. Mom looks pretty, too, with her curls. The bull calf has gorgeous brown rings around both eyes. But don’t let me persuade you. Judge for yourself. Photos taken within two days after birth. Three more young fellas are ready to leave their mommas. Despite the mud and wind — will this winter ever end — we rounded them up the other day for their glamour shots. And heifer calf Dayna is also for sale (still working on her photo). Please call Ken at 401-258-4281 if interested, for prices. Still for sale are several other young bulls and a nice bred cow-calf pair. Sorry, no photo yet of Dayna. To come soon. Russet Valley Farm, owned by the Panciera family, has been raising Polled Hereford beef cattle for more than 40 years. The former dairy farm, located in Hopkinton, R.I., is now home to about 35 to 45 cows, bulls, heifers and calves. Most are registered with the American Hereford Association. They are bred on the farm with our bulls or through carefully selected AI bulls. They’re raised on mother’s milk and our pastures, then fed on hay primarily grown on our acres. We know all the sources of their food, the status of each’s health, and their nicknames. We specialize in selling beef on the hoof, to buyers who may want to raise cows themselves, process them for beef for personal use or to sell through established markets. It’s hard work, every day. 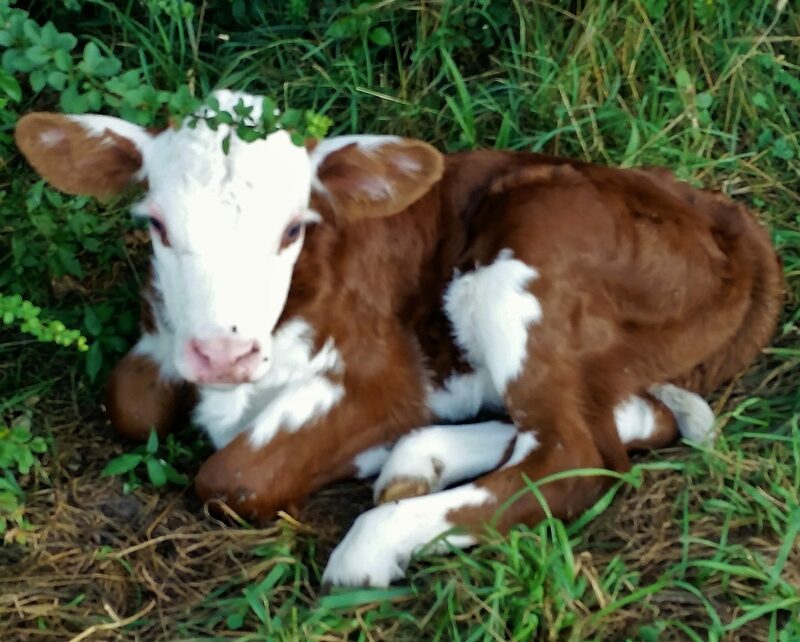 On this blog, we’ll post the latest cattle for sale, share seasonal photos and feature occasional musings by this farmer’s daughter. With so many family farms disappearing these days, we hope it makes you feel part of this precious landscape.